Brad Thor will sign and discuss Act of War (Atria; $27.99). BRAD THOR Hidden Order Meet the author dubbed “the master of thrillers” and hear him talk about his latest one, the story of a string of high-profile kidnappings/killings that has Washington D.C. in a frenzy. 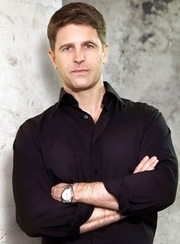 Brad Thor signs Signs Full Black (Atria $26.99), a Scott Harvath thriller. Brad Thor discusses Full Black. Brad Thor promotes Foreign Influence. brad thor reads from apostle. Brad Thor reads from The Apostle. Brad Thor on tour for The Apostle. Brad Thor discusses The Apostle. Brad Thor is currently considered a "single author." If one or more works are by a distinct, homonymous authors, go ahead and split the author. Brad Thor is composed of 4 names. You can examine and separate out names.